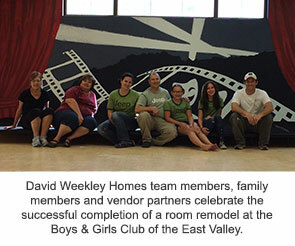 Phoenix, AZ (July 8, 2015): Team members from David Weekley Homes and vendor partners banded together over three days to remodel a room at the Boys & Girls Club of the East Valley, an organization that works with kids to build their talents and to share the value of contributing to others while realizing their dreams. For the remodeling project, David Weekley Homes volunteers repaired and painted walls, installed cabinets and countertops, arranged for a new sound system, portable stage, tables and folding chairs, and created wall murals. Vendor partners also helped with the remodel by donating materials and assisting in the installations, including MarLam Industries, Southwest Residential Interiors, Woodcase Fine Cabinetry, Safeguard Home Security, New Electric, Nally Construction Co, Outhouse LLC, and Sean Toolson. A branch of the larger organization, the Boys & Girls Clubs of America, the East Valley branch was established in 1963 and currently serves more than 43,000 children and teens each year through after-school and summer programs, and more. For more information about David Weekley Homes in Phoenix, contact 800-486-3956.